PicoQuant GmbH, specialist in single photon counting applications has extended the compatibility of its upgrade kit for laser scanning microscopes (LSMs). The kit that upgrades microscopes towards Fluorescence Lifetime Imaging (FLIM) and Fluorescence Correlation Spectroscopy (FCS), now also supports upgrades of the Zeiss LSM780 and the established Leica SP2 confocal laser scanning microscopes (CLSM). 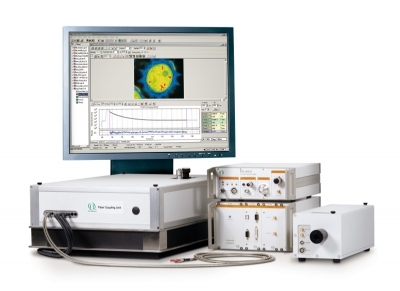 The upgrade kit extends the capabilities of a CLSM towards time-resolved measurements with a resolution down to picoseconds and allows users to perform various analysis methods on this time scale. The analysis of parameter dependencies is possible in a multitude of ways. It allows, for example, to calculate the fluorescence lifetime fluctuation correlation function (FLCS) on any single spot of interest, to reconstruct the fluorescence decay of each image pixel and detector channel for the purpose of FLIM or to perform advanced time-resolved Förster Resonance Energy Transfer (FLIM-FRET) analysis. Applying FLIM-FRET, not only the FRET efficiency can be deduced but also the fraction of complete FRET molecules. Two photon excitation or state-of-the-art picosecond diode laser sources for fluorescence excitation can be applied. The fluorescence emission is guided to photon counting detectors, such as Photomultiplier Tubes or Single Photon Avalanche Diodes and is finally recorded by the time-corelated single photon counting (TCSPC) module. The synchronization signals from the LSM scanner are fed into the data stream recorded by the TCSPC module via the unique Time-Tagged Time-Resolved (TTTR) data acquisition mode. In this mode each photon is recorded individually with its four specific parameters as detector channel, picosecond timing, global arrival time and pixel origin. With this development PicoQuant again demonstrates the continuous improvement of the FLIM & FCS Upgrade Kit not only for the newest CLSM types but also for older and established CLSM models to grant constant and high-quality customer support. The kit can be configured to different CLSMs, detector schemes as well as special demands in excitation and emission wavelength.